Trying to figure out pot sizes is often quite a headache. You've got some in inches, some in gallons, and yes, even some in fluid ounces; the later we're still trying to figure out. They do make this confusing, don't they? There's a theory going around that this purposely confusing system is a way for the mass market industry to charge more for plants, by container size, not necessarily Plant Size! 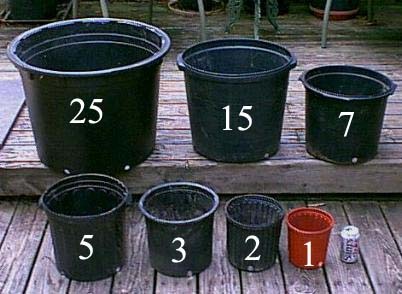 So let's try and break down these various sizes and measurements and set some general "accepted standards" for pot sizes. Please remember these are rough estimates and not a science. 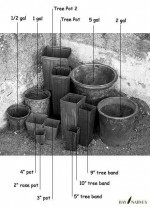 Some of the larger sizes especially are prone to variances in height, width, and depth of the pot. We've also attached two photos that we hope will help allow you to visualize the differences; click to enlarge them. If anyone has a smart phone they can download an app that tells changes one measurement to another. It works great and takes the difficult math out of the equation since the U.S measurement system makes zero sense. Thanks for taking the time to discuss this, I feel strongly about it and love reading more on this topic. What month comes before May?